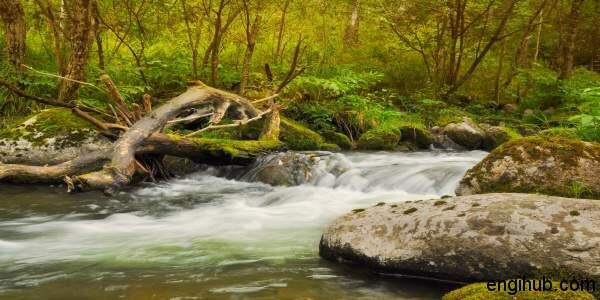 River discharge means the volume of water flowing through a river. This is the total volume of water flowing through a river bed at any given point and is measured in meter³/sec. The river discharge from a drainage basin depends on precipitation, evapotranspiration and storage factors. For various purposes, the Measurement of River Discharge is required in Dam Engineering. It requires a lot of Skill, Accuracy, and also lots of information on the subject. So, here you will come to know the three simple methods to calculate the river discharge. 02) Average Velocity of Flow. River Discharge = Area of Flow X Average Velocity of Flow. In this Method, the whole Width of River is divided into a number of Segment at Length, say L1, L2, L3 (Length of Segments) and at Depth say d1,d2,d3 (mean Depth of Segment). In this Method, the whole Width of River is divided into an even number of equal Segments, so that there is an odd number of Depths taken at the end of each Segment. With the help of Single Float, the Surface Velocity, at any section of River can be easily obtained. Hence For this, we have to count the time taken by the Float to Travel known Distance. The Velocity is Calculate by dividing the distance travelled by the Float by the time taken to travel that distance. This Surface Velocity is then converted into an Average Velocity. To obtain Average Velocity directly, a Double Float or Rod Float is used. It consists of two Floats connected by a Wire or String. One Float is a Small Wooden Float, which Floats on Surface of River. Another is a Hallow Metallic Sphere which is heavier than Water is suspended from the former by a Wire or String, connecting the two Floats, in such that, the Lower Metallic Float is at Depth of 6/10 of the Total Depth of Flow, as the Average Velocity of Flow exists at a Depth of 6/10 to the Total Depth. The Velocity of Flow then Calculates by Dividing the distance travelled by the Float by the time taken to travel that distance. This Method Directly gives the Value of Average Velocity. It consists of a Wooden Rod or a Metallic Rod Weighted at the bottom, so as to keep it Vertical or Inclined while travelling. The Length of the Rod is so adjusted that it should not touch the Weeds at bottom of the River and its top should be above the Water Surface. A Telescope Rod may also be used to suit different Depths. A section free from Weeds must be chosen to avoid possibilities of the Weeds at the bottom of River to Interface with Rod Float. Pump: How Reciprocating Pump Works? Hydraulic Devices: How Bernoulli’s Equation is applied in Hydraulic Devices?